More than two years since the last military operation in Gaza, we returned to industry representatives we had interviewed at the time to see how access policy changes have impacted their businesses. This is their account about the progress that has been made and the hurdles still hindering economic growth. A few months after the deadly, devastating hostilities, which took place during the summer of 2014, Gisha convened senior representatives from the five leading economic sectors active in the Gaza Strip: agriculture, textile, furniture, food processing and information and communications technology. Shortly after the military operation, Israel had declared that for the first time since tightening the closure on the Gaza Strip, in the summer of 2007, it would allow goods from Gaza to be marketed in the West Bank. We wanted to know what Gaza entrepreneurs, industrialists, and traders had to think about this. Particularly, we hoped to glean what the potential might be in light of the change in policy and also what it might take for them to prosper once their natural markets, Israel and the West Bank, opened up to them again; hearing about the potential in terms of creating jobs, cultivating professional knowhow, and garnering revenues. The findings are summed up in our document titled Made in Gaza. At the time, it seemed that the international community was rallying around the cause of helping Gaza’s economy to recover. Israeli political and security officials also voiced their support for reconstruction and said that with it would come greater stability. After seven years of closure, Kerem Shalom would be open to outgoing traffic of goods more than just the trickle going overseas, and goods made in Gaza started leaving for nearby destinations. It was clear that the optimism on the part of our interviewees, and their hopeful plans at business expansion, relied on the belief that physical access to markets in the West Bank and Israel was just a matter of time. Restrictions on movement are among the main obstacles facing women in Gaza who want to advance professionally. Two years have gone by. During this time, we reviewed and reported various decisions on the part of Israel, which limited the marketing that actually took place — restrictions imposed on the types of commodities that could exit, which days, to where and how. Over the course of 2016, “security blocks” were imposed on hundreds, if not thousands, of the lucky Gaza residents who are allowed to travel from the Strip in the first place, including, and perhaps mainly, traders and businesspeople. Those singled out as a security risk are denied freedom of movement, putting their businesses at risk and compromising the jobs their businesses create. The state of affairs as of early 2017 is as follows: unemployment in Gaza is on the rise, civilian infrastructure is lacking, and the overall economy is far from taking off. Lifting movement restrictions, for people and goods alike, is a prerequisite without which no sustainable growth can take place. The year 2016 was one of the toughest years in terms of freedom of movement for Gaza’s traders, entrepreneurs, and businesspeople. The Kerem Shalom crossing has yet to be fitted with protective cover to shield agricultural produce from the elements, despite the tremendous need for it. The height limit imposed on pallets of goods laid on trucks (a maximum of 1.2 meters for non-agricultural goods) increases shipping costs. Gaza’s agricultural produce remains largely banned from marketing in Israel, for reasons other than health and safety. In the West Bank too, only a limited list of produce is cleared for marketing. The lists of items defined by Israel as “dual-use” and thus restricted from entering Gaza harms the growth potential and ongoing, normal functioning of businesses. 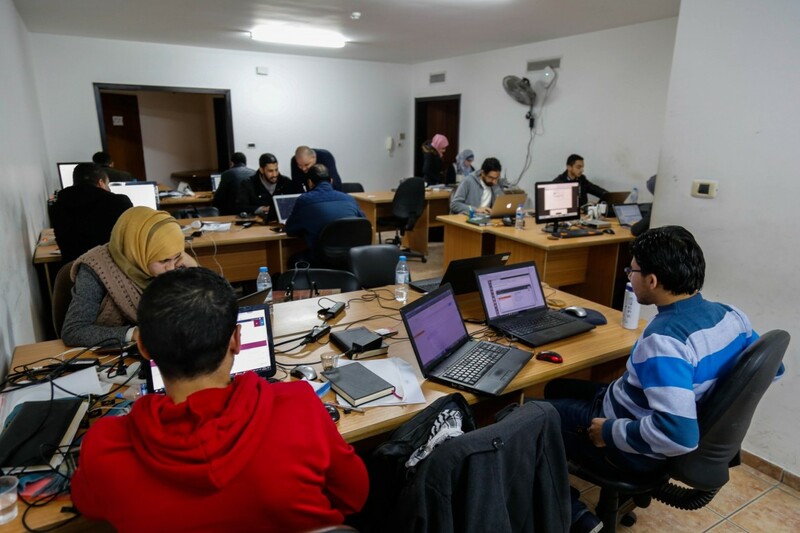 Gaza’s hi-tech entrepreneurs watch exasperated as bids that could be theirs fall into different hands, for no reason other than their inability to travel from the Strip for meetings and to demonstrate their potential. 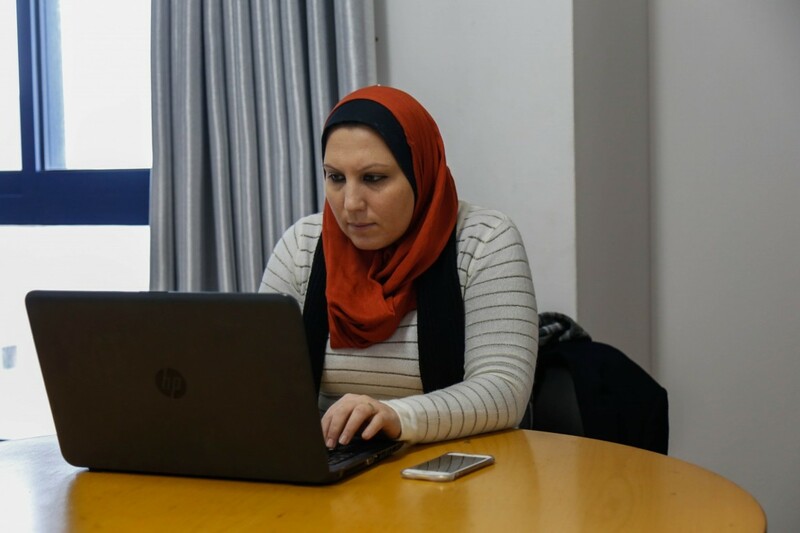 Hiba al-Tamimi, an employee of Unit One, an information technology company in Gaza. 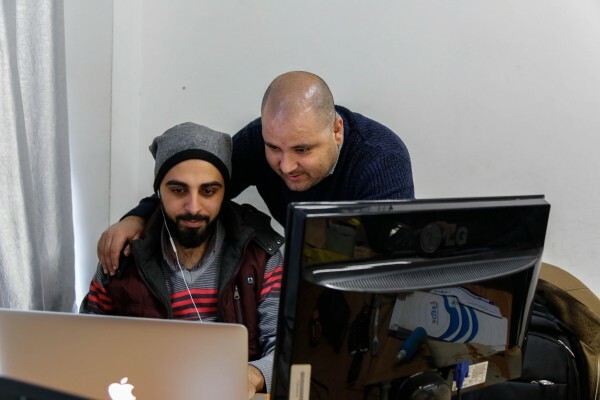 In the aftermath of Operation Protective Edge, we met with seven Gaza ICT company owners, who estimated that at the time, they sold around 15 percent of their products and services to the West Bank. Despite their industry’s apparent lesser reliance on movement of people and their ability to bypass physical obstructions by means of electronic communication, movement restrictions still had a high impact. In many instances, the companies felt that their chances of doing business in Europe and Arab countries were better than in the West Bank, as their prospect of traveling abroad, even if slim, could theoretically take place via the Rafah border crossing while travel to the West Bank and Israel is more difficult. The participants estimated that if their staff were allowed to travel to the West Bank, they could market 30-40 percent of their products and services there, thus doubling their sales. They further estimated that Gaza companies could provide products of equal quality to those offered by West Bank companies, for lower prices, as labor in Gaza is cheaper. Gaza’s ICT industries did not benefit from easings in access that benefitted some other local industries in the aftermath of Operation Protective Edge. Restrictions imposed by Israel on movement of people and goods, particularly in the ICT sector, have generated a chilling effect, and West Bank customers do not readily seek the services of Gaza suppliers. According to people in the industry, the movement of staff, particularly senior staff, is necessary if solutions are to be offered to problems encountered by those purchasing services. It is also vital for them to be able to access the West Bank and Israeli hi-tech scenes. It is not enough to have companies signed to new projects; it is important to get out, network, and keep up with hi-tech developments around the West Bank and Israel in order to be able to offer relevant and up-to-date services to new companies. The ICT industry is also vulnerable to the ravages of Gaza’s irregular power supply as well as restrictions on entrance of goods. Israel restricts the entrance of essential equipment defined by it as “dual use”, which means that companies in the industry struggle to develop and expand the scope of services they offer. This remains true two years on. Set up in 2005, Unit One specializes in developing software and applications for a variety of services. It also offers data entry services and professional training courses. Among other things, the company has developed a computerized system and application for the Palestinian Civil Affairs Committee in Gaza, allowing applicants to track the processing times of their exit permit applications. The company is headed by Saadi Luzun and Ahmad Abu Shaaban, both 35. Until recently, the two employed roughly 110 people: 75 female staff (mostly in data entry roles, with numbers varying by period and according to workload), and 35 permanent engineers. The first year. Saadi Luzun: “Following the war, we could feel some significant improvement as far as staff movement. I, personally, obtained a three-month, renewable permit. This allowed me and my partner to travel to Israel and the West Bank on a regular basis. I held many face-to-face meetings with colleagues from companies in both the West Bank and Israel, like Intel and Microsoft. I also travelled to Jordan for business meetings. This relative freedom of movement was an advantage that allowed me to close deals quickly. “In the year following the war, I closed deals with five West Bank companies and for the first time, with three companies in Israel as well, to provide design and work inspection services. For instance, I worked with a company in West Jerusalem that provides communication-related services for stock markets in Dubai and the Emirates, which was a first-of-its-kind experience for us in providing programming services. We provide outsourcing services for companies in the West Bank. Two of my employees obtained exit permits and travelled to meet with representatives from companies we’d worked with in the West Bank. This allowed companies over there to see the work we do up-close. “During this period, I recruited eight new employees for these projects. I estimate that the scope of our work increased by 30% due to these deals. I could travel to Jordan and fly to the Netherlands, and I had the option of attending conferences, presenting our company’s services and giving updates on Gaza’s ICT scene. Specialists from the Netherlands arrived to the Strip, accompanied by Dutch government advisors, to visit our offices and see the services we provide”. Saadi Luzun (Right) with one of the engineers employed at Unit One. “In May 2016, we began feeling a major regression due to the security block policy exercised by Israel. My application to renew my permit was denied on ‘security grounds’. Nevertheless, I was summoned for a security interview, which was followed by yet another denial on security grounds. Same goes for my partner and company employees who had managed to obtain exit permits in the past. We went back to doing business by phone. “There’s a huge difference between striking deals by phone and closing them in face-to-face meetings. Work meetings allow you to get a personal impression and take in cues in body language, as well as demonstrate to potential clients that I can deliver the goods and meet their demands. Israeli companies, for example, are really interested in working with Gaza companies, due to the quality of the work and its low costs, but given the situation, and the easy movement between Israel and the West Bank, they prefer working with the West Bank. Three out of the five West Bank companies we work with sell services we provide to them in Israel. “We currently only employ 35 female workers, on top of our 30 permanent engineers. The decline in employment we are seeing here is a direct outcome of security blocks and the fact that the company cannot get representatives out there and close deals, due to these blocks”. “Dual-use” items. “Early this year , Israeli restrictions on the entry of hardware products we use at work were heavily tightened. With the rise in work volume, we started thinking about expanding the office space. To do that, we needed two Cisco network switches, a company that has a branch in Israel. We submitted an application to purchase the devices, which facilitate network operations. We sent photographs of the devices and the spots where they were going to be installed. It was only two weeks ago that we got a reply – a negative reply. A reply for an application we submitted to Israel roughly 1.5 years ago. “The same goes for most communication devices, even cables, whose entry is banned even when it’s for communication companies. We use cables that come in through the [smuggling] tunnels, costing 15 NIS per meter, five times as much as cables from Israel, for a very poor quality product. Stuff like that sets work back. We are forced to stop working on the network and switch off devices, due to the load capacity, and we are unable to improve operations, because they won’t let us bring in the devices required. It leads to losses for the company because we have to stop work for an hour or two, paralyzing the employees and then failing to complete work on time. And if we don’t deliver the work on time, we can’t pay employees’ wages”. Unit One offices in Gaza. Equipment is lacking due to restrictions on the entrance of “dual-use” items. Electricity dependence. “Last July, the electricity bill and expenses I incurred trying to maintain regular power supply in the two apartments we use for our offices – including the fuel bought for two generators – reached $600 a month. That means we run higher expenses for energy than for rent of our offices, which is a financial catastrophe. Power outages affect our work, both because the network connection, naturally, relies on electricity and due to potential damage to our servers”. Current state of affairs. “We’re actually back to how it used to be before the war. You can’t work under the restrictions imposed by Israel. This way no one outside Gaza is going to consider us. The technology market is about participating in conferences, showcasing services, and striking deals face-to-face. It’s an international market where you keep in touch with suppliers from all over the world. Everyone else has the option of traveling, inviting specialists to meet with them, participating in conferences; if I’m unable to partake in that, I can’t bring in new work”. A worker at a textile workshop in Gaza. If you don’t know whether your products will be bought, it’s risky to manufacture. In the aftermath of Operation Protective Edge, Israel approved certain Gaza goods for marketing in the West Bank, including textile and clothing items. In November 2014, the first truckload of clothing set out from Gaza to the West Bank. By March 2015, goods from Gaza, including textile, were cleared for marketing in Israel, albeit in a very limited manner. Our focus group two years ago included four manufacturers who, before the closure, had marketed the lion’s share of their goods in Israel. Going back to them now, it turned out one of them had sent a couple of shipments to Israel, while the others hadn’t sent any. Here we present a conversation with a manufacturer who markets to the West Bank, but did not participate in the original focus group. Quantities of goods marketed. On average, nearly three trucks per month leave from Gaza to the West Bank. The last two years have failed to live up to participants’ expectations, who predicted that 30 trucks per month were going to exit. In other words, the current amount going out constitutes roughly 10% of the rate anticipated by the manufacturers we spoke with in 2014. According to Tayseer Al-Ostath, head of the Textile and Garments Union in Gaza, the total revenues of the industry in 2016 were roughly eight million NIS, up by roughly 60% from 2015. He says that out of 160 companies registered with the union, about 26 market to the West Bank, while approximately 18 market to Israel. Data gathered about movement through the crossing does not reflect this reality. Because of difficulties in issuing value added tax (VAT) invoices, trucks of goods first go to the West Bank, where all tax-related procedures take place and from there, goods make their way to Israel. Textile sector employment. In the year 2000, the industry employed around 37,000 workers; by 2005, this number was down to 25,000. It is estimated that in 2015, the industry employed approximately 3,000 people, while it has since gone up to 5,000; roughly 20% of the 2005 total and only 14% of the total in 2000. As noted by traders two years ago, in order for them to be able to market and resume a work output of 40-50 percent of the industry’s peak production times, they must re-learn the West Bank market and re-establish connections with traders there, following many years of being denied commercial ties. To save on shipping costs, traders share expenses by coordinating shipments. A trader can send 500-1,000 items in an order, and in the current state of affairs, it is simply not cost-effective to cover shipping expenses alone. Shipping cargo by truck from the storeroom in Gaza to the Tarqumiya crossing, outside Hebron, costs more than 3,000 NIS. Given the revocation of thousands of traders’ permits, the ability to coordinate shipments has been compromised as traders lose their markets. Union head Al-Ostath notes that recently, there have been attempts to meet with representatives in Israel in an effort to improve marketing and boost business ties, but as Gaza traders have yet to obtain permits, these meetings have yet to take place, and marketing to Israel is set to be heavily affected as a result. Majd Zaqout is the owner of Majd Clothing, which manufactures jeans, children’s clothing, and traditional women’s attire. He employs 75 people: “We have been selling traditional attire for women, the jilbaab, in the West Bank from almost as early as the region was opened up for marketing. The economic situation is tough over there too, but nevertheless, we’ve managed to develop new ties, and we’ve been marketing there, though on a small scale”. Zaqout says that due to marketing efforts in the West Bank, the company’s sales have gone up, leading to an increase in the number of employees working for the company. Before the West Bank was opened for marketing, they employed 50-60 workers. West Bank sales volumes now stand at 100-200,000 shekels per month, varying by season and demand. These figures are hardly significant, but better than no sales at all, says Zaqout, so he is envisaging some improvement and development for his company. Zaqout’s company employs a head sales agent in the West Bank, who supplies goods to several local companies. On average, they send approximately 1,500-2,000 items per month, mainly dresses. The marketing of children’s jeans failed to meet expectations. Zaqout says that before the closure, jeans accounted for most of his profit in the West Bank. These items had a very extensive market, from Hebron to Jenin, and as late as the year 2000, the Gaza business was prospering due to their marketing operations in the West Bank. Transport of goods. A single pallet would be stacked with 20 cardboard boxes of clothes, Zaqout explains. Each box is packed with 10 winter gowns or 18 summer gowns. The shipping cost of each pallet can reach roughly 400 NIS. Before the closure, transport costs were lower and above all, no complex pre-coordination was required. “We have been selling traditional attire for women, the jilbaab, in the West Bank almost since the marketing of goods was first permitted. The economic situation is tough over there too, but nevertheless, we’ve managed to develop new ties and we sell goods there, though on a small scale”. For the time being, Zaqout’s company is not marketing to Israel. Zaqout says he lacks the connections to make it happen; he is making an effort to find suitable companies to market to in Israel, through meetings and gatherings in Gaza and Israel held by the union. In the meantime, his efforts are focused on his ongoing marketing to the West Bank, where he has contacts. Muhammad Abu Shanab, owner of the Abu Shanab Textile factory and former head of the Gaza Textile and Garments Union, used to employ ten people. Today, he says, his factory operates at a production output of 10% of its capacity. His focus is actually on the Israeli market, but “things have been very tough. Most factories and manufacturers are almost out of work. The lot of us, put together, market no more than a single truck a month, two at best”. In an interview Gisha held with him a few months ago, Abu Shanab says he hasn’t started manufacturing winter products yet, because there’s no point. The winter has yet to set in and most importantly, demand is yet unclear. When the going gets tough in the market, he says, you don’t risk it by manufacturing products that are not necessarily going to sell. “Ramadan, the holidays, and back-to-school season are supposed to be excellent times for sales. Not this year. There was not a day where I worked to full capacity or nonstop. There’s no demand, and in periods where you expect to prosper, you find yourself out of work, let down, and full of worry”. Security blocks. “Gaza traders must encourage their West Bank and Israeli counterparts to work with them, so that they have places to market to, and things at the moment are very tough, particularly due to security blocks imposed on traders and the denial of trader permits. Traders’ ability to travel in and out is essential for their work, so they can meet colleagues, promote sales, and close deals”. As noted in the focus groups of two years ago, Abu Shanab too asserts that around the West Bank, they can identify the goods coming from Gaza; their quality is higher than those arriving from Turkey or China, who took over the market in the absence of products made in Gaza. Abu Shanab sells his goods in Israel as well. He says that traders in Israel are interested in his products, but are fearful that the security situation could deteriorate, compromising the steady flow of goods. In 2016, he supplied products to religious Jewish buyers: yarmulkes, neckties, and children’s socks. Due to the complications related to VAT invoice issuing and thus to direct marketing to Israel, Abu Shanab opened a West Bank factory. Between February and June this year, he marketed to Israel from there. He argues that West Bank workers are not as skilled and professional as their Gaza counterparts, and in addition, they are paid higher wages. The West Bank project turned out to be unprofitable and Abu Shanab ended up shutting it down. Ibrahim Bashir, owner of an agriculture import-export company in Gaza. New opportunities for marketing were opened. As part of the original focus group, we met with eight representatives from the Gaza agricultural sector: a marketing professional, five traders and farmers working with associations and cooperatives, and two independent traders. At the time, the group estimated that if restrictions imposed on marketing to the West Bank were lifted, 200 trucks per month of agricultural produce could be marketed there or roughly 30% of Gaza’s total yield of agricultural produce. Early in November 2014, the first truck set out, stacked with cucumbers, from Gaza to the West Bank. It was the first shipment of its kind after a seven-year, sweeping ban on goods being marketed in the West Bank. The types of produce cleared for marketing to the West Bank are limited, and some of them are seasonal, like cauliflower or cabbage, leaving a very narrow window of opportunity for the sector as a whole. West Bank-bound agricultural produce can only be shipped out on specific days: Sunday, Tuesday, and Thursday. On the day of shipping, crops going to Israel undergo lab tests by Israeli Ministry of Agriculture staff at the Kerem Shalom border crossing, in addition to the regular, roughly hour-long inspections performed on incoming and outgoing goods. Quantities marketed. The monthly average number of truckloads carrying agricultural produce to the West Bank between November 2014 and November 2015 stood at 67 truckloads, a third of the average expected by the traders. In March 2015, Gaza tomatoes and eggplants were cleared for exit to Israel because of the “shmita” year (every seven years, religious Jews believe agricultural lands are to lie fallow and they are thus forbidden from eating produce cultivated on lands owned by Jews. This creates a market for non-Jewish farmers). A monthly quota was set of 250 tons for tomatoes and 50 tons for eggplants. Ahead of this, traders were requested to send crop samples for lab tests in Israel, with only tomatoes and eggplants cleared for exit. Despite paying over 25,000 NIS for these tests, traders have yet to receive the results or evidence that they actually took place. From March 2015 to November 2016, a monthly average of 24 truckloads of tomatoes and eggplants left for Israel: 250 tons of tomatoes and 47 tons of eggplants. As part of the original focus groups two years ago, traders raised an important issue whose implementation could help bring down shipping costs of goods: lifting the 1.2 meter height limit for pallet of goods stacked on truck beds, which constrained traders for years, pushing expenses up. In February 2016, it was decided to allow agricultural traders to stack goods up to 1.5 m, which meant a considerable reduction of transportation costs. Another respite was introduced in the form of the revocation of the demand to transport goods in sealed trucks. The Kerem Shalom crossing has no shading facilities, however, leaving produce exposed to the rain in the winter and blistering sun in the summer. On more than one occasion, goods were damaged after sitting out at Kerem Shalom and suppliers were informed that their goods had not been delivered. Gaza traders have more than once requested that shade facilities be installed at the crossing, so far to no avail. Marketing of strawberries. Following two months of marketing to the West Bank, strawberries were banned throughout 2015, due to allegations that they had leaked to Israeli markets via the West Bank. It was only in 2016 that strawberries were re-cleared for marketing, in a monthly quota of 150 tons, on two days per week only (instead of the three days stated in the produce-marketing procedure for the West Bank). The process is mediated by a West Bank-based Palestinian company, who undertook to prevent any leakage to Israel. In the run up to winter 2016, the quota and middle-company restriction were lifted. 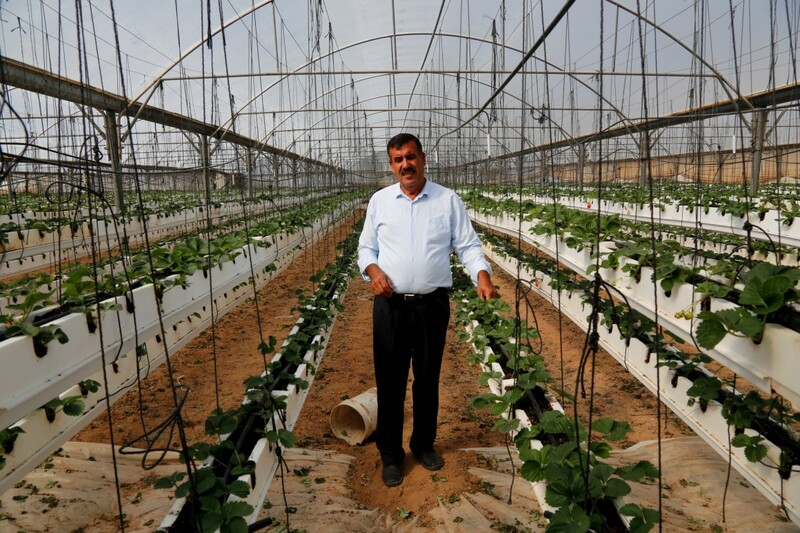 A farmer in his greenhouse in Gaza. If restrictions were removed, farmers would expect an increase of 60-70 percent in marketing. “In the two years since agricultural goods were cleared for marketing to the West Bank, as well as a limited set of items to Israel, my company has managed to market different types of agricultural goods to both the West Bank and Israel. We haven’t achieved the targets we had our sights set on two years ago, but we succeeded in realizing about 60% of our expectations. New horizons have opened up as far as agricultural marketing. I, for example, am now at the final stages of setting up refrigeration facilities for produce storage, with USAID support. I currently have 10 workers collecting produce from the fields. Farmers themselves have been bouncing back too, though not all our aspirations are realized”. “The Israeli market is the main market for vegetables grown in Gaza, and prior to the closure, our company used to market 60% of its goods to Israel. Even today, if restrictions are lifted, the Israeli market is more lucrative for me than its West Bank counterpart. Traders in Israel asked for more tomatoes and eggplants, but the Israeli trader and I alike are subject to Israeli government decisions. I’ve had no exit permit for three months now, due to ‘security blocks’, which is a serious problem for me [true to November 2016]. Now, for instance, for the first time, I’m exporting onions to Saudi Arabia through Allenby Bridge. I’m unable to make it to Jordan and see how things are going up close, I can’t try to speed up processes with customs agents and authorities, or with traders in Jordan, the middlemen between me and buyers. I’m doing it all by phone. My being there could have been very productive. Freedom of movement would allow me to further develop the company, reach new markets and meet customers to increase the pace of sales”. Kerem Shalom crossing. “Another problem is the conditions at the crossing. Having solved the pallet height limit issue, the big problem now is the crossing’s [lack of] covering, particularly during the winter. Yesterday I had to buy a plastic sheet to cover and shade each pallet. Covering the goods costs roughly 100 dollars per truck, on top of all the other costs of transporting goods around the Strip, in and out of the crossing and to the final destination, which are high as it is. This expense could have been saved if the crossing was covered. “The introduction of marketing led to some recovery in Gaza’s agriculture sector. I believe that this season, there are more vegetable crops being grown. Take onions, for example, which we used to buy from Israel. Now they can be found in high quantities around Gaza and we’re exporting them overseas. There are more tomatoes, particularly in greenhouses. Eggplants and bell peppers quantities have doubled”. Agriculture in Gaza. Greater freedom of movement would allow for further development. Marketing to Israel. “Traders in the West Bank and Israel started re-considering the Gaza Strip and its products. Personally, we’ve experienced a 40 percent increase in our productivity since marketing opened up. We’re setting our sights further, aiming at a 60 or even 70 percent increase, which is attainable, if restrictions are lifted. If marketing to Israel is expanded, I personally expect to send out around 30 trucks per month. Currently I already have eight workers and two trucks, and I would be able to employ 14 workers and market another truckload. “For those of us who market goods, a truck carrying goods from the field to Kerem Shalom Crossing costs 650 shekels. Then it’s another 20 shekels in customs duties on the Palestinian side, 500 shekels for unloading and re-loading goods, and a further 200 for certifications in Israel. The cost of a truck to carry the goods from Kerem Shalom to the West Bank or Israel stands at 2,500-3,000 shekels, of which 700 are paid as taxes, from the freight company to Israel’s Ministry of Defense. Costs of shipping to Israel have gone down a bit, because we work with regular drivers, who are more accommodating”. Recovery of the agricultural sector. “There are problems in Gaza itself as well. The Ministry of Agriculture demands that we pay 2.5 dollars in taxes for every ton of vegetables marketed outside the Strip, retroactively, since marketing began, two years ago. 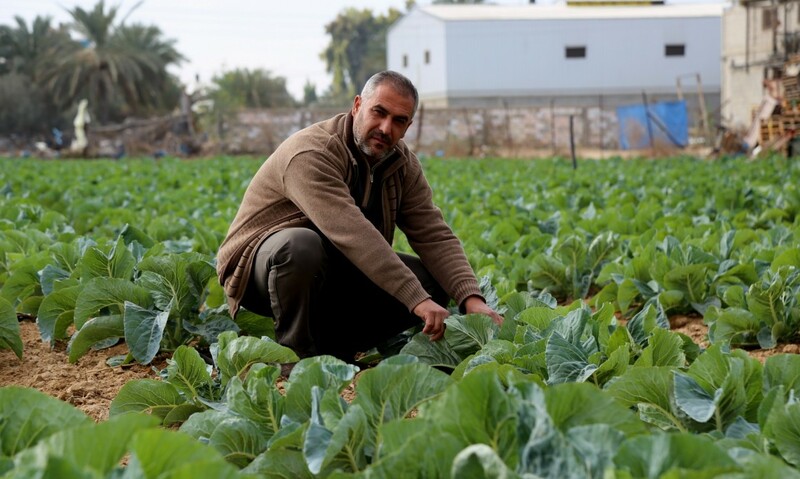 “I’m hopeful and certain that we can restore Gaza’s agriculture to its pre-closure state. We have the opportunities and the will to carry on and move forward. I’ve rebuilt my ties with traders in the West Bank and Israel, as well as Jordan and Saudi Arabia. Improvement in agriculture will also affect the overall economic situation in Gaza, where agriculture is one of the main trades. We shall recreate thousands of jobs for the unemployed agricultural workers”. Cautious optimism and hope for recovery and economic prosperity are still there. There has been some progress since the worst years of the closure when zero Gaza-grown and -manufactured goods were permitted for sale in their primary markets: the West Bank and Israel. It is also obvious that progress so far has been slight and slow relative to potential. A change is indeed possible, and it is largely reliant on Israeli officials: allowing uninterrupted access to markets and business partners in the West Bank and Israel; ensuring regular, efficient movement of goods and travel of manufacturers, traders and businesspeople, which is a precondition for development and true, sustainable economic growth. It is essential to put an end to the arbitrary, reckless meting out of “security blocks”, whose incidence throughout 2016 heavily affected Gaza traders and the business community at large. Israeli officials, including in the highest political echelons and the military’s top brass, recognize the potential benefit of allowing economic growth in Gaza, including for Israel’s security. The sweeping constraints imposed on economic development are in breach of Israel’s commitments, infringe on the right to freedom of movement and undermine the best interest of residents throughout the region.